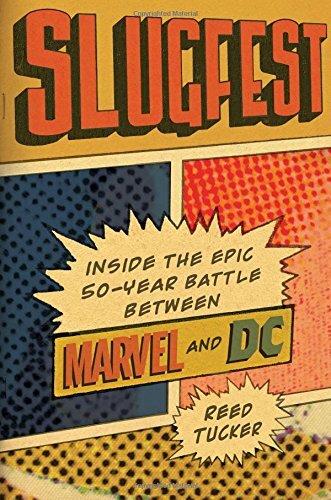 Dec 18 Clash of the Titans: An Interview with the Author of "Slugfest"
In an era when our society is riven by acrimonious and seemingly intractable divisions, we've become nostalgic for a more carefree societal division: whether you were a Marvel or DC fan as a child. The feelings surrounding one's corporate allegiance ran high, to be sure, and the passions behind them ultimately played a big part in fueling globally iconic brands and billion-dollar box offices. Author Reed Tucker has tapped into the intensity of this rivalry and its history in his recently published book Slugfest, and Hogan's Alley editor Tom Heintjes discussed the making of the book with Tucker. Tom Heintjes: Did you grow up a lifelong comics fan? Reed Tucker: Hell, yeah. I was trying to think the other day what was the first comic I ever owned, and I can remember being a small child in the late 1970s and getting a free comic out of a cereal box. Anything that came inside a cereal box was cool at that age, but that thing was like treasure to me. I recently went on eBay to look for those comics, and I discovered the one I remember probably came from a promotion Post had with DC in 1979. They gave away these mini-comics with Batman and Wonder Woman and the others. I still can remember what that comic felt like coming out the cereal box, wrapped in plastic and covered in Honeycomb dust. I read comics all through childhood, in part because they were much more available back then. They’d be there on a spinner rack at the 7-11 or the B. Dalton’s bookstore. You didn’t have to go hunting for them. I’d buy two or three to read on a car trip. When I was about 12 or so, a friend took me to a comic specialty store in Richmond, Virginia, where I grew up, and it blew my mind. It was my first glimpse of true comic book culture. Comic books were so underground and marginalized back then that I had no idea that there was this whole world of serious hobbyists out there who collected and revered them. The one thing I really remember about that store is that they were dead serious about protecting their back issues. The store was packed with dozens of long boxes full of comics, and the customers weren't allowed to touch them. You had to ask the cashier to get you whatever book you wanted. It was more like an unfriendly museum than a fun pop culture store. Tom Heintjes: What were some of your favorite titles or characters? My favorite DC superhero title was Giffen, DeMatteis and Maguire’s Justice League, maybe because it was very un-DC. I really enjoyed the comedic spin on the cast of usually stodgy heroes. I tended to prefer the Marvel characters in general. I loved Wolverine when he was hot in the 1980s. Loved Spider-Man. Loved Daredevil, mostly due to Frank Miller. Loved Elektra: Assassin and anything by Bill Sienkiewicz. Heintjes: What inspired you to pursue the idea of the rivalry between Marvel and DC? Tucker: I like rivalries because they have the most important element of storytelling built right in: conflict. It’s a pretty easy starting point for a book right there. You don’t have to gin up anything or try to fake the drama. It’s baked in. I’m a Tar Heel, as I know you are, and UNC has this long-burning feud with Duke, so I think going to school in that atmosphere made me more cognizant of rivalries. As a child, I can remember kids on the playground arguing about whether Marvel or DC was better or whether the Hulk could beat up Superman and all that dumb stuff. So I was always aware of this divide. The thing that really cemented the idea for the book though was a few years ago when DC threatened to release Batman v Superman on the same day as Marvel’s Captain America: Civil War. People online kind of exploded. Lines were drawn all over again. I was surprised not only that this tribalism I remembered as a kid still existed, but that it was, if anything, even more passionate than back then. The superhero movies gave the fans something new over which to divide themselves all over again, or at least a new opportunity to express their love of Marvel and their hatred of DC, or vice versa. Once I started looking into the rivalry even more, I realized there was so much fun stuff and so many interesting anecdotes and that the rivalry speaks to a lot of what’s going on today with DC and Marvel in mainstream pop culture. That said, the people who did agree to talk to me—and there were a lot of them—were incredibly generous. Obviously, the book would not exist without them. They were really patient about talking to me in person or on the phone and answering a bunch of follow up questions. It goes along with one of the reasons I like comic book culture and conventions. There’s a friendly vibe and a sense of community, maybe because there’s a feeling that we’re all nerds in this together. DC and Marvel didn’t cooperate at all. I reached out to them and got the runaround for a few months. I never expected them to help, but I did want to give them the chance, of course. Heintjes:It was so interesting to me how incapable the DC executives were of seeing what factors were behind Marvel's rise. Do you think this was because they weren't truly fans of what they were producing? It came across to me as if they were slightly contemptuous of their own product. Tucker: That’s probably part of it. The only comic Irwin Donenfeld, who ran DC until Kinney bought it in 1968, read was supposedly Sugar and Spike, a humorous book about two toddlers. He was also reasonably dismissive of a comic book’s content. He was obsessed with covers and thought they were the only thing that mattered in the comic book market. So when Marvel came along with a new way to tell superhero stories, I think it escaped some at DC because they weren’t particularly focused on the story possibilities, especially when it came to appealing to older readers. There was also a sense of superiority among some at DC. They had launched the American superhero with Superman and they had been the class of the industry for years. There was a feeling that no one could touch them, and that arrogance helped keep the blinders on. Heintjes:I've always heard a story about, when Marvel finally overtook DC in sales, Stan Lee gathered the staff and essentially said, "We've always had change in our universe. Now I want the illusion of change." But that anecdote isn't in your book, which leads me to think it's apocryphal. Have you ever heard that? Tucker: I’ve heard the same, and I think some version of it is probably true. Roy Thomas has said that Stan told him and writer Gary Friedrich something similar in the late 1960s. This was before Marvel overtook DC but after Marvel had broken out. I think I understand Stan’s position. His line of books had become unexpectedly successful, and these characters had become incredibly valuable. I can see that some fans saw this edict as a betrayal of Marvel’s early innovative spirit, but what was Stan meant to do? Kill off Spider-Man? In a way, Marvel became trapped by its own success. The more well-known these characters became, the less leeway the company had to mess with them. In part, that’s one of the reasons the death of Gwen Stacy was so shocking. A prominent character actually got killed off. Stan has claimed in recent years that the story was written without his knowledge while he was away in Europe, but the writer, Gerry Conway, has said that he ran the plot point by Stan. I believe Conway on that one, which suggests Stan might not have been so wedded to the whole “illusion of change” thing. Anyway, I didn’t include all that in the book because, like so much, I just didn’t have the room and had to make a million hard choices. Heintjes:In the mid-80s, DC really shook thing up with Watchmen, Dark Knight, and Swamp Thing. And it was Marvel that appeared creatively sclerotic, even if their sales were higher...very much an inversion of the situation a couple of decades earlier. Why was Marvel not able to see the role reversal under way? Tucker: I don’t think Marvel cared. DC was branching out in different directions, in part, because they had no other choice. They’d stumbled at the superhero game and had nearly gone out of business in the 1970s. Marvel was cleaning their clock month after month. DC had to get more daring and creative. They had to try new things. And that’s when they took a shot on a radical reinvention with The Dark Knight Returns and when they let a mostly unknown British writer take a stab at mature horror in Swamp Thing. The broadening of the kinds of books DC published worked out in their favor, but I don’t think anyone was certain at the time that it would. Frank Miller likes to talk about how DC execs hated what he was doing with the Dark Knight and was afraid to publish it. Steve Bissette, one of the artists on that great Swamp Thing run, told me that when he and Alan Moore took over, sales of the title were around 16,000. It was basically dead, so DC had nothing to lose by shaking it up. Meanwhile, Marvel has always been and remains much more of a traditional superhero company. They’ve never really expanded beyond those narrow parameters, but the niche focus didn’t really hurt their sales, as you mentioned. They were the market leader back then and they remain now. They’re in the business of making money obviously, so they don’t have much incentive to change. I do find it disappointing that Marvel doesn’t publish more non-traditional titles or have an imprint similar to DC’s Vertigo. I’d like to see the kinds of books that would come out of there. They did have the Max imprint a few years ago, but that seemed like little more than excuse to let existing characters say the F-word. Heintjes:Can you discuss sourcing? How cooperative were people in talking about events, personalities and other potentially ticklish topics? Were there people you really wanted to talk to who just refused to discuss those events? Tucker: It was mixed, as I mentioned before. There were definitely a few people I would have liked to talk to that escaped me for various reasons. Would have loved to have had Joe Quesada, not just because he’s been high up at Marvel for so many years, but also because of what he did revitalizing the company with Marvel Knights. The one person I was most sorry not to get was Bill Jemas, who ran Marvel during the early 2000s and was determined to poke DC in the eye as much as possible. I tried to get an interview. I called him, sent him letters but never got a response. I think he knows he made quite a few enemies in the industry and he probably wants to put his tenure at Marvel behind him, which is fair enough, I guess. Heintjes:Related to that, many of the principals from the early days of the DC-Marvel rivalry are dead. Who would you have liked to talk to but couldn’t? I would have absolutely loved to have spoken to Irwin Donenfeld. His personality and motivations remain a bit of a mystery to me. Another is Carmine Infantino. He presided over DC at such a critical juncture, in the late 60s and early 70s, when DC was losing its grip on the market and desperately trying to meet the challenge from its rival. But the one person I didn’t really know much about that I became most interested in having written this book is Arnold Drake. He’s a person that I think doesn’t really get his due when it comes to the important figures in comics history. Not only did he write some great stories and come up with some great characters, but he was one of the earliest at DC to recognize the challenge from Marvel and he tried to push the company in new directions. He was also really outspoken, which is always great from a journalistic perspective. Note: You can order a copy of Slugfest by clicking here.